Optometrists perform a variety of tasks for patients. According to the U.S. Bureau of Labor Statistics, the optometry field is expected to grow by 24% by 2022. This rate of growth is much faster than those found in any other occupation in the country and is attributed to an increase of services designed for a growing aging population and recent innovations in eye care technology. Optometrists specialize in procedures that involve examining the eyes, diagnosing existing problems and treating common eye issues. 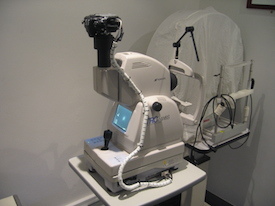 They typically utilize a variety of optometry equipment in their practice, including diagnostic tools, measuring tools for determining contact size and eyeglasses prescriptions, and tools for vision therapy and rehabilitation. In order to stay on top of this rapidly advancing field of medicine, optometrists need to have the latest equipment designed to diagnose a variety of eye problems and assess the overall eye health of patients. Leasing optometry equipment has become a popular choice for eye professionals who want an affordable way to stay on top of the latest technology. FinancingMED provides assistance in the acquisition of all types of optometry equipment, including exam chairs, digital refraction systems, tonometers and ophthalmic ultrasound machines.